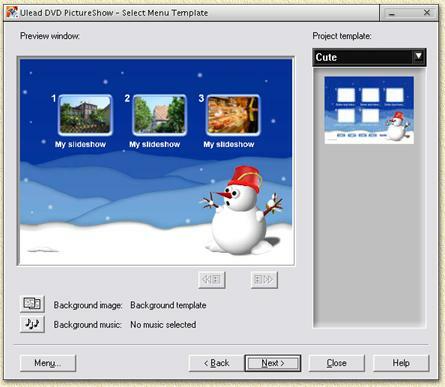 DVD PictureShow by Ulead is a very nice and easy to use application to create a VideoCD or DVD holding your photo's (either made with a digital camera or scanned). In this short guide I'll show you how to create your own Photo-VideoCD or Photo-DVD, which you can playback on your PC and on most standalone DVD-players. Note: not all DVD players are capable of playing VideoCD. You can download a trail version (limited number of albums and a limited number of photo's per album) at the ULead website. The application is pretty cheap, something like $39. Naturally one needs photo's to be able to add them to a VideoCD or DVD. For photo's you can use basically any common file format, like: GIF, BMP, JPEG (also the new JPEG 2000 format! ), TIFF , PSD and PNG. If you want to combine it with video fragments then you're on the wrong page. DVD PictureShow is not supporting movies. You can create a similar disc with for example Nero, see "Photo VideoCD with Nero" for details. If you haven't installed the application yet, then do so now. For those who'd rather test the application first, download a trial version at the Ulead's website and finally install the application. The trial version is limited in the number of albums and the number of photo's per album, but it will give you a good impression on what is and what isn't possible. After installing, the application should be available in your Windows START-menu. Click "Start" - "Programs" - "Ulead DVD PictureShow" and finally click "Ulead DVD PictureShow". The first window that appears let's you choose if you would like to create a "VCD 2.0" (VideoCD) or "DVD". If you do not have a DVD-writer or if you plan to write the photo's on a CDR or CDRW, then please select "VCD 2.0", since the result of a DVD burned on a regular CDR or CDRW is very likely not compatible with your standalone DVD player. Capacity: VideoCD allows a maximum of 1900 photo's on it. This does not mean that this much images will fit the CD, it's just a limitation of the specification of VideoCD. If you do have a DVD-writer and plan to write a DVD (-R, -RW, +R, +RW), rather go for "DVD" as you may experience similar problems as seen burning DVD's on a CDR or CDRW. I haven't had the chance to really test this since I do not own a DVD-writer (anyone donate one?). Capacity: DVD allows a whopping maximum of 9801 photo's on a single disc. Once again - this does not mean that this many will actually fit - it's specification limitation! In the lower right corner you see a "Menu" button. Click it once with the left mouse button. A popup menu will appear showing you several options, the first being "Preferences" - click it. This little dialog window shown below now appears. You can copy these settings and click "OK". The settings shown above are pretty safe settings for users that live in Europe (PAL). Residents of the USA should copy the same settings but check NTSC instead of PAL. Note: PAL uses a higher resolution and therefor a slightly better image quality. Note: it's safe to skip this section and continue to the next ... it's for reference only. This is used to set the resolution properly for the target TV-system (Europe: PAL, USA: NTSC). Secam users should check PAL. Note: most DVD players are capable of playing either formats. Most modern TV-sets can handle both PAL and NTSC. Allows you to specify a title safe margin. This is the margin between thumbnail and title text of that particular thumbnail. For the title safe area, as a guideline for different devices, use 12% for NTSC and 10% for PAL. Reduces "interlace" flickering, always check this option as it will improve picture quality when displayed on a TV. Check this if you are experiencing trouble with your DVD/VCD player. DVD PictureShow will now use the so called Constant Bitrate (CBR) as defined in the VideoCD standard. If not checked a variable bitrate (VBR) which some DVD/VCD players cannot handle in VCD mode. If you plan to add music - this option will limit the capacity of the disc to 70 minutes of playback time! So consider switching it off for that purpose. Don't forget to click the "OK" button once you're done customizing your settings. After you choose either "VCD 2.0" or "DVD" and maybe did some "Preferences" changes, it's now time to actually build your Photo-VideoCD or DVD. Click the "Next" button to get to the "Create slide show" window. Before we can do anything, you will have to set the source of your pictures first. Usually you get the photo's from files, so make sure the dropdownlist, left from the "Add Slideshow..." button shows "Images from File". Finally click "Add Slideshow..." in order to create your first album of this disc. A new window appears, allowing you to add individual photo's to an album (naturally, the "Selected images:" bar will be empty at first). This can be done using drag and drop as shown with the red arrow in the image below. Optionally you can select each image one by one and click "Add Image" (double click an image works too! ), or add all images in one go by clicking"Add All". The "Arrange" button opens a new window that allows you to modify the order using drag and drop. Tip: You can maximize this window, so you will be able to see more thumbnails. This can be done by clicking the "Maximize" icon or simply by double clicking the title bar (where it says "Create Slideshow"). In this area, you can select the folder that is holding you picture files. Navigation is similar to the navigation you use in Windows Explorer, so that should look familiar. Will show you the content (i.e.. images) found in the folder you selected in Area A. The images shown can be dragged to the lower part ("Selected images:") of area C.
Edit the title of this current album. Tip: Multi line titles can be done by pressing CTRL+ENTER at the end of each line. Allows you to add a sound-track to this album. It will be played during playback of the slide show of this album. Supported file formats are WAV, MP3 and MPA. You cannot add audio tracks from an audio CD - you will need to rip it first (see: How to rip to MP3 or How to rip to WAV using Nero). Determines the time each image is displayed when the slide show is played in seconds. Rotate image, selected in "Selected Images:" 90 degrees to the left. Rotate image, selected in "Selected Images:" 90 degrees to the right. Remove image, selected in "Selected Images:", from the slide show. Remove all images from the slide show. Play image from the "Selected Images:". Clicking it again will stop playback. Playback will also stop when the "Delay time" has past. Once you completed this album you can click "Done" and return to the previous screen where you can add more albums by clicking the "Add Slideshow..." button. An already made album can be opened again by double clicking it in the "Slideshow list". So you're done creating albums? OK, click the "Next" button so we can do some theme settings for the menu. Here we can set the layout of the menus. Below "Project Template" you can select the layout you would like. The drop down box will show you available themes, like "Cool", "Classic", "Business", etc. In the scrollbar below that you will see thumbnail examples how they look like. Double click the one you like and it will instantly be applied. Naturally, the predefined themes are very cool, but most of us prefer their own background image. This can be done by clicking the button. You can also have a background music here. Click to select the soundtrack you want to use. Here we can use WAV, MP3 or MPA format only as seen before. Tip: for vacation trips I usually buy a really nice postcard and scan that into my computer. Then I make the postcard very light (increase brightness and decrease contrast) as a background. When you've finished the details on the theme, you can now click "Next" and take a look at the preview. The remote control on the left allows you navigate (unfortunately some buttons like "skip" etc are missing) your show to see how it will show on a TV. Click "Next" if you're satisfied, or click "Back" to return to the theme page. We now arrived at the "Output settings" window where we do some final preparations before burning this CD. Location where Ulead DVD Pictureshow will "render" the CD or DVD image. The value below the input field shows you the amount of disk space needed for this particular DVD or CD (here: almost 600 Mb). Any disk or folder that has enough space. Burning speed. You can set it to Max if you have burned CD successfully before on this PC at Max speed. Otherwise select a lower value. The burn process will be simulated in order to see if speed settings are OK. The CDR/CDRW/DVD will not be written on. Depends on your CD-writer, some do other don't support buffer under run protection (Burn Proof is one of them). Label of your CD or DVD. Usually a name that either makes sense or is part of a sequence. 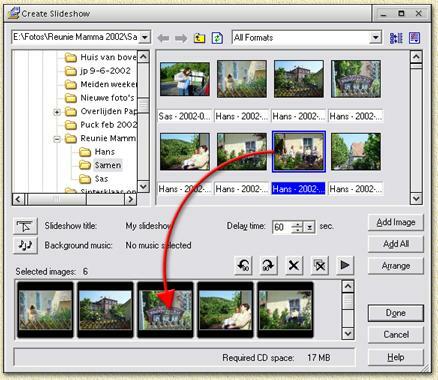 This option allows you to save the pictures, additionally, in the original high-res file format. This way the images are stored on the VideoCD or DVD and can later be used for making hardcopy. Note: if this option is not available, then you might want to check Ulead for an update! This option allows you to use large filename - for example in the photo filenames that are stored in a separate folder. Now click "Next" to continue. In the now upcoming window you will have to make sure "Record to CD:" (or "Record to DVD:" for DVD) is checked. Optionally you could use the option to write to image file ("create image file"). Note: if you're writing to a CDRW, it can be usefull to use the "Erase CD" button for cleaning out the CDRW. After the CD has been completely burned, you can try it on your PC using DVD playback software, or play it on your standalone DVD player to see if it all works. Tip: You will need a capable DVD playback program to play this CD! Some DVD playback programs do not even support this format! Don't forget: a copy of the original image files are stored in a folder on the CD - if you check the proper option.